What is servicing a watch? Doing these things is called "servicing" a watch. In past days, when animal-based oils were used in watches, and no watch was waterproof or dustproof, servicing was required yearly. Today with the good synthetic oils and greases we have, and rubber gaskets, it's normal for a watch to run 5 years or more on a service. Accutrons in particular need to be serviced on a schedule because they will keep running long past when a mechanical watch would stop. 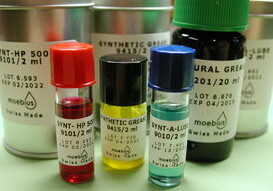 I use Moebius oils and greases, which I buy in small quantity and replace before their expiration date. I use L&R cleaning and rinsing solutions in a multi-stage automatic ultrasonic machine. The parts are cleaned and rinsed in multiple stages while being scrubbed by the ultrasonic, and then blown dry with heated air. Under a stereo microscope I inspect every jewel and pivot after coming out of the machine, to make sure it's scrupulously clean. This cleanliness is critical to making oil stay where it's placed. I clean watches fully disassembled. I inspect every part. I use up to six different oils and greases, more in some watches than others, depending on the size and features of the watch. I do all oiling under the stereo microscope, in order to apply just the right amount, and see that it goes in just the right place. 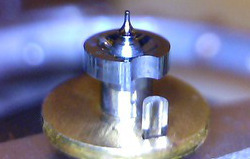 To perform final regulation of your watch, I use one of several timing machines, depending on the watch type. I regulate your watch in a way that I believe will keep good time for you when worn. For pocket watches I assume you will wind the watch in the morning, then wear it (mostly pendant up) for the day, then place it dial up at night. For mechanical wrist watches, the primary positions are dial up and crown down. A basic servicing does not include extensive testing in positions or positional adjusting. I am happy to quote positional adjusting separately. Accutrons all have the same positional adjustment inherently, and are regulated according to the original service recommendations, -2 seconds/day dial up, if worn on the outside of the wrist. I will ask you how you wear your Accutron! I will clean and lightly polish the case and crystal of the watch, if appropriate. Extensive cosmetic refurbishment is not included in the cost of a service, but basic cleaning is. I am happy to quote cosmetic refurbishment separately. I will replace gaskets, if appropriate, but I do not guarantee the water resistance of any watch. Many vintage watches do not have any gaskets or waterproofing provision, but some do. Accutrons always get a new case back gasket and, if a 214, battery hatch gasket. Even watches marked waterproof should be protected from water.